Summary: Attorney General William Barr’s summary of the Mueller report says there is insufficient evidence that President Donald Trump or his campaign colluded with Russia during the 2016 election. In response, the White House claimed victory, while Democrats insist the full report be made public. As of Tuesday, the only document that has been released to the public is Barr’s four-page synthesis of Mueller’s report. Trump sent out a list of Democrats who claimed there was evidence that he colluded with Russia, insisting they be held accountable. Meanwhile, Democrats point out that although Trump wasn’t charged with obstruction, he also wasn’t exonerated. To learn more what American voters think about the Mueller report, read this article by the Associated Press. Directions: Read the summary, watch the videos and answer the discussion questions below. You may want to turn on the “CC” (closed-captions) function and read along with the transcript here. If time is of the essence, you might want to stop the segment at 3m:33s. 1) Essential question: Why has the Mueller report further divided political leaders and the public? 2) What do you know about the Mueller investigation? What prompted the investigation? What did the investigation have to do with Russian meddling in the 2016 election? 3) Why was Special Counsel Robert Mueller’s full report not released? Do you think the full report should be released to the public? Explain your response. 4) According to Barr’s synopsis, the Mueller report stated that Russia interfered with the 2016 presidential election by attacking Trump’s opponents on social media and stealing emails from Hillary Clinton’s campaign and the Democratic National Committee, however, the Trump campaign did not coordinate these actions. Why is this distinction be important? Media literacy: When you heard stories about the Mueller investigation, what were the headlines? 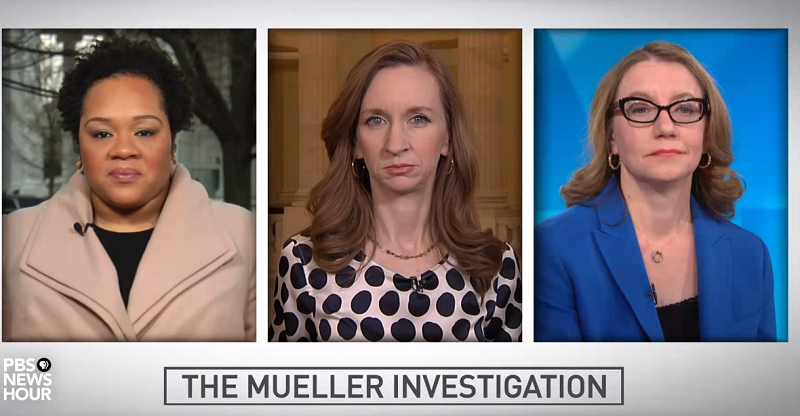 How is the news media currently covering the news of the Mueller report? 5Barr’s office has not stated if he will release a copy of the full Mueller report. What are the challenges in covering this subject for the news media and understanding it as a voter and citizen without the full report? Dig deeper: Have students dig deeper into the U.S. democratic system as it relates to the Mueller investigation, Russia’s interference in the 2016 election and President Trump’s financial ties to Russia. 1. The nearly two-year investigation of special counsel Robert Mueller into Russian interference in the 2016 presidential election concluded with Mueller’s final report delivered to Attorney General William Barr for review. PBS NewsHour and FRONTLINE illuminates the complex details behind the Mueller investigation and analyzes what’s yet to come. You may wish to watch parts of the documentary below in class or assign parts of it to your students for homework. 2. Republicans say the attorney general’s four-page summary of the Mueller report exonerates President Trump on obstruction of justice. Democrats counter that William Barr’s analysis is not sufficient to answer that question. Judy Woodruff talks to Neal Katyal, former acting solicitor general under President Obama, and Paul McNulty, former deputy attorney general under the first President Bush. See the transcript here. 3. In November, PBS NewsHour’s Lisa Desjardins spoke with David Sanger, national security correspondent for the New York Times, and Matea Gold, enterprise and investigations editor for the Washington Post, about potential conflicts between Trump’s business and policy interests. Why do you think Trump’s financial interests with Russia were not a focus of the Mueller report? (remember: the Mueller report focused on collusion between the Trump campaign and Russia during the 2016 presidential election.) See the transcript here. 4. There is no doubt that Russia’s government attempted to influence the 2016 U.S. presidential election. As William Brangham reports, once the U.S. intelligence community reached that consensus, as well as high confidence that Russian President Vladimir Putin personally ordered the cyber and social media “disinformation” campaigns, a major investigation and dozens of indictments followed. See the transcript here. Essential question: How important is it for the United States attorney general to be impartial when it comes to enforcing the law?